Samsung today unveiled its latest tablet to take on the iPads — the Galaxy Tab S2 8.0 and Tab S2 9.7 — featuring the world’s “thinnest and lightest metal tablet frame” for devices of their size. The tablet is impressively thin and light (5.6, 265g/389g) and comes in two different screen sizes: 8-inches and 9.7-inches. Both variants of the tablet come with a Super AMOLED display that is capable of “delivering 94% of natural tones to show true-to-life colors.” The display has also been optimised for reading and comes with a dedicated ‘Reading mode’ that tweaks the screen’s brightness to reduce eye strain over a longer period of time. Other specs of the Galaxy Tab 2 include an octa-core Exynos processor clocked at 1.9GHz, 3GB RAM, 32/64GB of internal storage, a microSD card slot, an integrated fingerprint scanner on the Home button, Wi-Fi b/g/n/ac MIMO, Bluetooth 4.1, 8MP rear camera and a 2.1MP front-facing shooter. The 8-inch tablet also comes with a 4,000mAh battery, while the 9.7-inch variant comes with a 5,870mAh one. On the software side, the tablets run Android 5.0 Lollipop with TouchWiz on top of it, which comes with features like Multitasking, Pop-Up Window, Smart Manager, and more. Samsung is also bundling Microsoft’s Office Solutions on the tablets, along with free 100GB of storage space on OneDrive for two years. 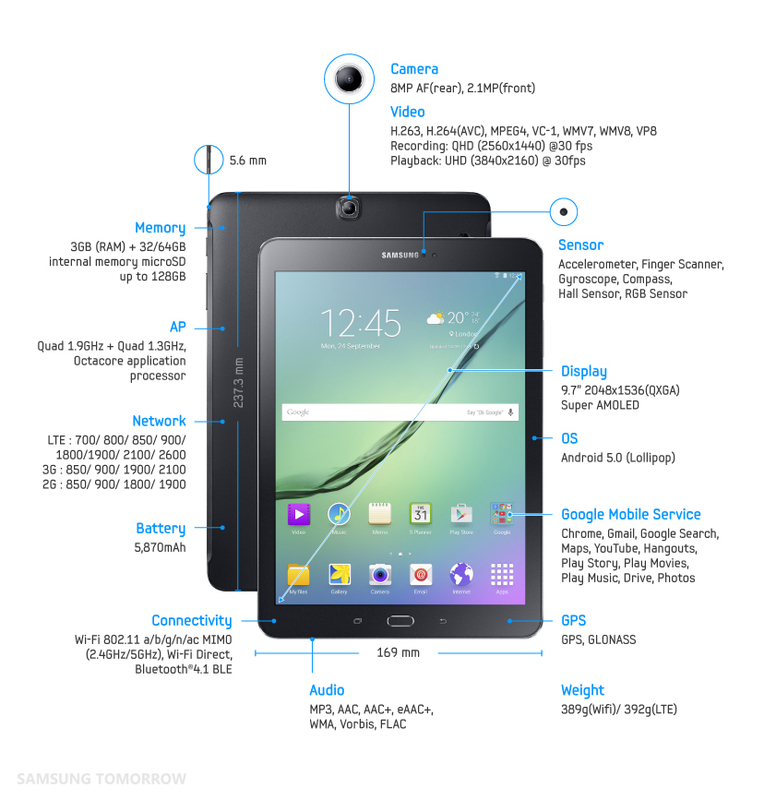 The Galaxy Tab S2 will be available in Wi-Fi only or 3G/Wi-Fi variants in global markets from August 2015.